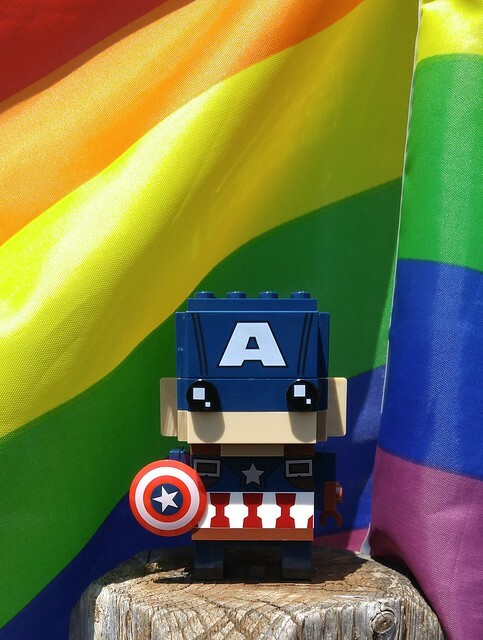 Summer Of LEGO 2018 Day 3 – American Pride! Happy America Day to all my friends south of the border! To celebrate the occasion I decided to build (another) Captain America Brickhead. Fitting, eh? I really like this figure, but I have to admit that I’d like to have a traditional Cap Brickhead more. I’ve always loved the Captain. He’s my second favourite Marvel Super Hero because he stands for everything that’s in good in America and the rest of the world. It’s good to remember that just because June is over and with it Pride Month, being an ally is a year-long responsibility. So wave your flags and raise your mighty shields in celebration of pride, patriotism and perseverance. Have a great 4th Of July, Everyone and Play Well!